This earnings season is make or break for this market, because we need earnings growth to resume if the S&P 500 is going to continue to grind higher and test the former all-time highs, and 3,000 in the S&P 500. With 25 of 505 S&P 500 companies having reported results, the blended growth estimate is a negative 4.6%, with 8 of 11 sectors expected to show a year-over-year EPS decline. That’s a big swing lower from expectations for growth of 3.0% estimated as of Dec. 31. As of April 5 more companies are cutting earnings guidance than usual, leading analysts to make bigger cuts to their forecasts. 74% of the S&P 500 companies that have issued earnings guidance have lowered expectations, above the five-year average of 70%. The average analyst EPS estimate has been lowered by 7.3% during the first quarter, compared with the five-year average decline of 3.2%. 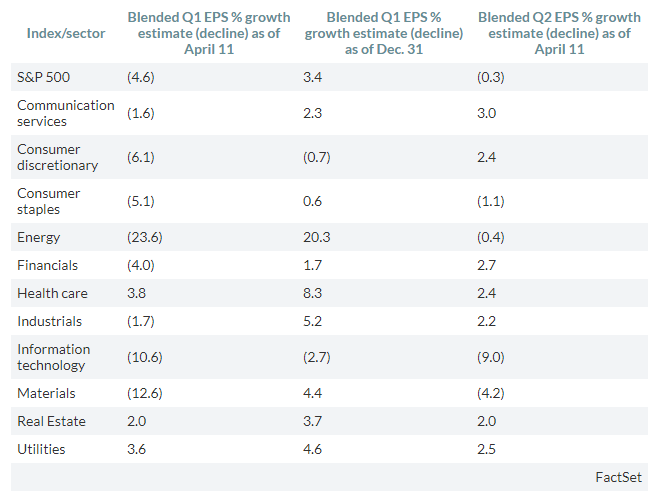 The three sectors expected to show EPS growth are health care at 3.8%, utilities at 3.6% and real estate at 2.0%. perhaps more important for the outlook for the stock market is that the blended EPS growth estimate for the second quarter slipped into negative territory on 04-10-19 to -0.3% from a rise of 3.4% as of Dec. 31. SOURCE: 04-11-19 - - "Risk of earnings recession rises, as S&P 500 profits to fall for first time in 3 years"
THE “JAWS” WILL BEGIN TO CLOSE IN APRIL WITH EARNINGS GUIDANCE THE MARKET’S “ZERO CORPORATE TAXES” SUGAR HIGH!